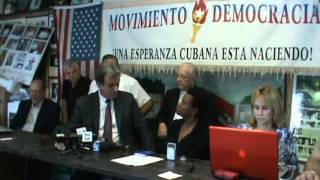 #MIAMI-based Cuban exile group Democracy Movement yesterday raised concerns that a key witness in the hearing to determine whether Bahamian marines abused detainees at the Carmichael Road Detention Centre might have changed his version of events because of alleged “intimidation” tactics by the Cuban government. #His words came in a statement following remarks from lawyer Wayne Munroe, who is representing the accused marines. Mr Munroe said that Yordan Cantero’s testimony on Tuesday before a Royal Bahamas Defence Force panel changed from his original statement. #Mr Munroe said there were several inconsistencies that made Mr Cantero’s account different from another detainee and Immigration officials, which were recorded after the alleged incident. #“Unfortunately, it now appears that our fears have materialised and that the witness has been intimidated enough to contradict his own original testimony in order to affect the outcome of the proceedings followed against the accused guards. #Mr Sanchez expressed disappointment that Mr Cantero, despite being a key witness in the incident, was sent back to Cuba a short time after the alleged abuse occurred. 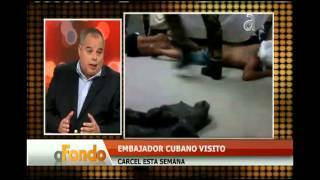 #“Yordan Cantero was quickly repatriated to Cuba without being properly interviewed by the investigating entities in the Bahamas. This happened after a suspicious meeting between Cuban officials and the minister of foreign affairs of the Bahamas. #Mr Cantero, Carlos Pupo and Alexander Vazcuez were allegedly beaten after they attempted to break out of the Detention Centre on May 20, 2013. Hearings into their allegations reconvened earlier this week. The proceedings initially began in November after a series of protests against the Bahamas and statements by the Democracy Movement. #The proceedings were adjourned on Tuesday, according to Mr Munroe, to allow the Ministry of Foreign Affairs “reasonable time” to locate Mr Vazcuez whose testimony is the final piece of evidence needed to wrap up the prosecution’s case. #However, Lorenzo J Palomares-Starbuck, attorney representing Mr Vazcuez told The Tribune by email that his client was residing in Miami and was willing to testify via Skype or through a deposition at the law offices of the Palomares-Starbuck and Associates in Florida. #Mr Vazcuez told a Florida talk show host this week that hi client suffers from psychological problems and chronic spinal pain more than a year after the alleged incident.